I'm surprised I have not seen this news posted anywhere but this morning there was an incident on Raging Wolf Bobs. Although there were no injuries there was serious damage to both train and track and apparently the ride will be closed for the remainder of the season. FYI this has been confirmed by two independent sounces, see http://tinyurl.com/2te8tx. 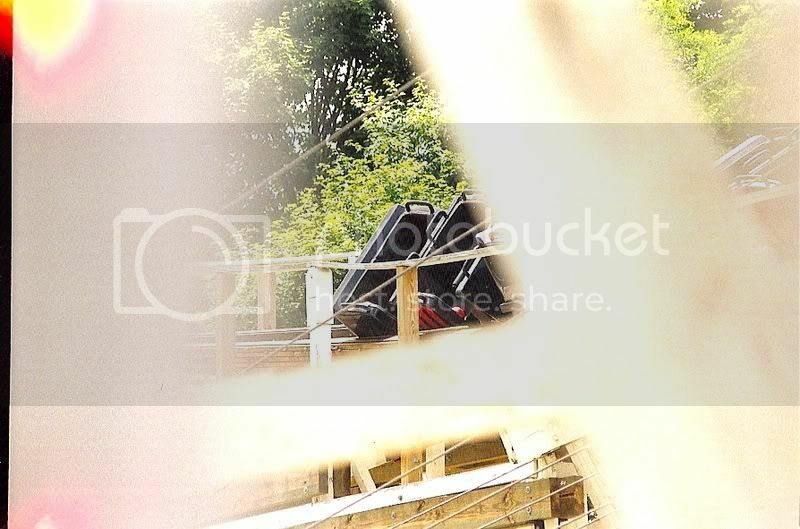 The Coaster EXT event was at the park today so I'm sure word [and pics] of this will be out soon. Wow. I was at the park yesterday, but didn't arrive until late. RWB wasn't running, but I didn't bother to go investigate why. Just what GL needs, something else going wrong! Maybe its time that CF unload this jinxed park but I doubt this will happen. I wonder how much of an effect RF2 at Waldameer will have on this park next year. Sure Waldameer is considerably smaller and has fewer coasters but a new major coaster has to create some interest in that park from areas within day trip distance. Why does Cedar Fair have these problems with wooden coasters? Last year it was SOB at KI and now this. Of course the SOB problem was probably inherited from Paramount. Meanwhile the woodies at KW, IB, KG, HW and even little Lakemont keep going as usual. Mybe there is something about family owned parks and wooden coasters that appear to work out especially well. I do know that the Knoebels and the Kochs, among others, really do care about these rides. I haven't read any official news reports on this, but, I can't help but wonder if it was a test run. How could a ride that does so much damage to the train and track NOT injure anyone that was riding it? Who makes the trains for RWB? It was not a test run. 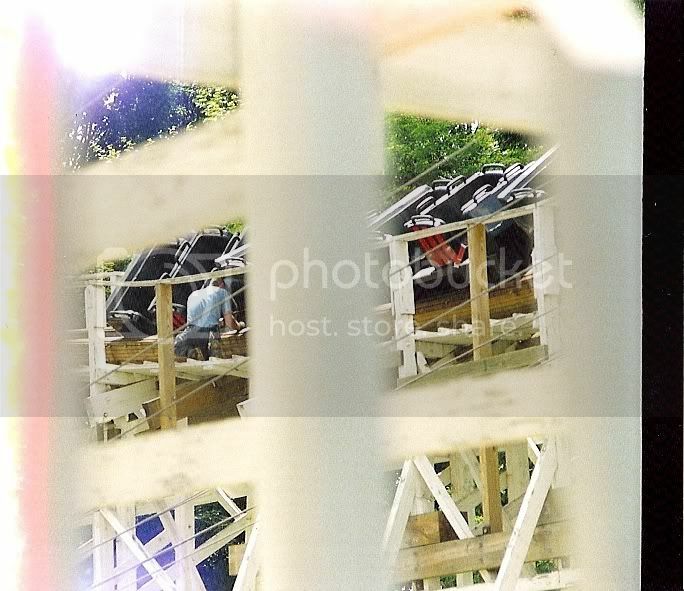 Raging Wolf Bobs is running two Gerstlauer trains. One was the third train from the Villain, the other is the original train from the Legend. It was that train that was involved in the incident. There were paying customers on the ride at the time of the incident; I spoke with one of them much later in the day. I could not tell where the train derailed, but after the derailment the loose car broke five or six ledger boards and caused several tension cables to either break or come loose. Some are saying the ride is done for the year, but it looks to me like the damage is really no worse than when part of the lift hill collapsed a few years ago, and that incident was dealt with in just a few days. ^They are running G trains now? I had no idea. I thought they were running PTC's? They've been running Gerstlauers ever since Six Flags started the retracking project a few years ago. The original trains were PTC trailers with the hitch geometry all screwed up (see: my article about it). 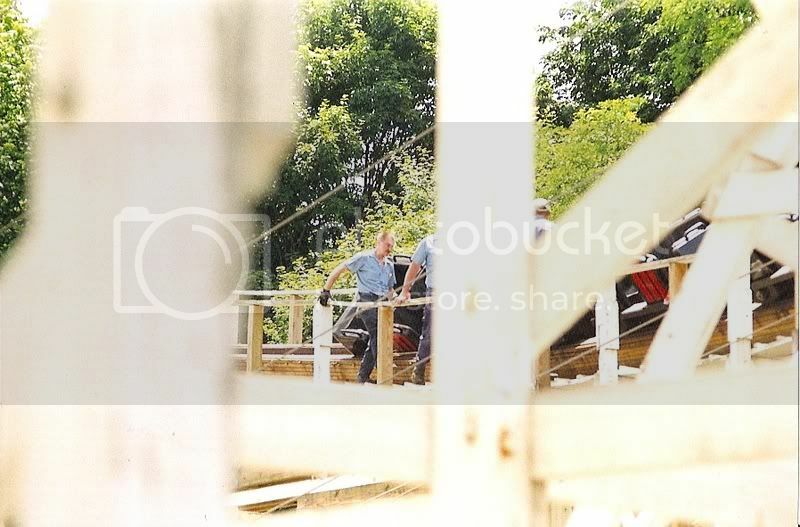 Once they started retracking they decided to use an articulated train (the Gerstlauers) in an effort to not have the track torn up before the rebuild was complete. I have to agree with Dave. It didn't look that bad to me either. Obviously there will be some sort of investigation. But, considering they just finished the retracking a year ago, I can't imagine there being much wrong with the new wood. I would imaging the failed wood was something they didn't replace. But, in the process of retracking, I would think that if there were any major problems, they would have noticed them then. All that being said, evetything said right now is speculation. Including the statement that RWB is done for the year. Here are a few pictures that I took a few minutes after the event happened. This is just after the cross over going into the turn around. Man CF just doesn't need this after all the problems they've had with rides recently. Last year the derailment on Wild thing & the incident on SOB just prior to the paramount aqquisition & finally the valleying incident on Raptor & now this year the low speed collision on Magnum,along with the pre-opening day malfunction on Borg & now this. Just close the park down already. Are the maintence guys going to be fired for this? If you ask me, CF has cut the budget on some dept's at some parks to dangerous and annoying levels. I have no proof of any wrong doing and am not accusing them of anything but it's one of those, THINGS THAT MAKE YOU GO HUM things as it's a very rare ocurance on a woodie. Matter of fact of the three in the last 20 years. Two of them were the NY Cyclone. Come on, Chuck. You absolutely are accusing them of something, else you wouldn't have speculated.